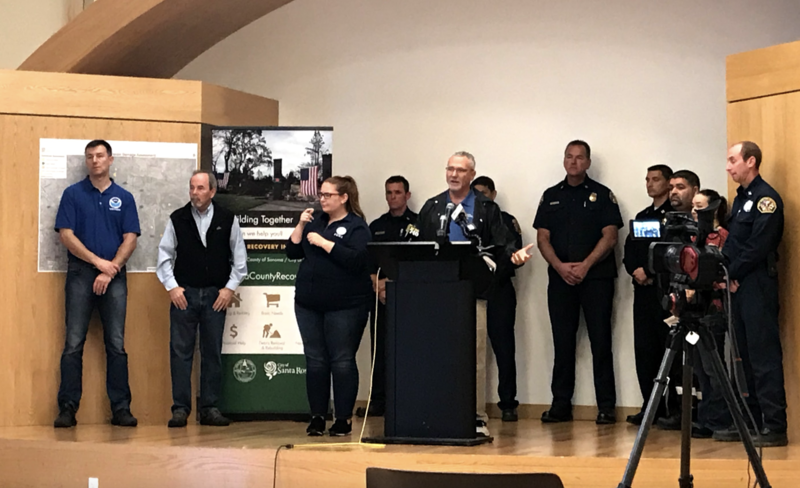 SANTA ROSA, CA – On November 12th, the City of Santa Rosa provided an update on their assessment of the city’s storm drain infrastructure that was damaged in the recent fires. A map that reflects the latest assessment information can be found here: https://goo.gl/hjNGXt. The City of Santa Rosa in conducting an assessment of the storm drain system to identify any areas that were compromised by the fires. Out of an abundance of caution, providing today’s information as a safety precaution to ensure everyone is informed of the potential risks posed by the damaged storm drain sections. Residents will see a lot of crews in and around neighborhoods doing assessments. City, county, state and federal partners are rapidly completing an initial assessment in the burn areas to identify and address risks. We want residents to be prepared and alert as this situation unfolds. 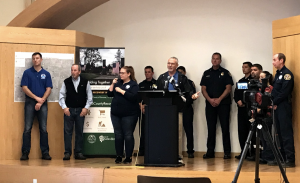 We will continue to provide updates through social media and the Recovery website www.sonomacountyrecovers.org, as well as our alerting tools if needed. City staff went into the field to assess infrastructure following the fires and observed burned storm water pipes. Staff identified sections of the storm drain that are plastic pipes made of high density polyethylene that were destroyed by the fire. The destruction of these pipes resulted in underground voids and cavities that could cause sink holes and increased chance of landslides and flooding. One sink hole has occurred and emergency repairs have already begun. To assist in the response to this issue, the city has reinstituted its Emergency Operations Center. There have been and continue to be crews in the field using closed-circuit television cameras to inspect the system. Teams of engineers and geotechnical experts are using that and other data to conduct risk assessments. The city is making plans for emergency mitigation measures and repairs, with some repair work already underway. Crews will be in the field during the upcoming rain events with emergency personnel standing by to closely monitor the impact of the rain in compromised areas. Once we address the most urgent areas of concern, the city will be repairing all of these damaged drains and pipes. The Emergency Operations Center is open and coordinating the assessment process. The City wants to ensure residents are prepared if they are asked to leave. Staff went door to door to talk to residents in the area in the morning to explain the need for the assessment and what efforts were underway to address areas of concern. The City is asking Fountaingrove residents to have a plan to leave if it is necessary. If you see buckling roads, sinkholes or evidence of flooding, call 911. It is critical to to sign up for SoCoAlert at socoalert.com and Nixle by texting your area code to 888-777. More information can be found on sonomacountyrecovers.org. There is a storm expected to start tonight or tomorrow morning beginning with lighter showers. The bulk of storm is expected mid-morning (9am) to early afternoon (2pm) on Wednesday. Expect 1/4 to 1/2 inch of rain in valley and as much as 1 inch in the hills during this storm. Winds are expected to be 10-15 miles per hour, with gusts up to 25 miles an hour. A break in the rain is anticipated on Tuesday, but a wetter storm expected on Wednesday and Wednesday evening. The area could see 1/3 – 3/4 inch in the valley and as much as 1.5 inches in the hills. Then a third storm is anticipated next week, but its strength is uncertain at this time. We are expecting active rains for the rest of November before any prolonged break. Q: Can you talk about the one active sink hole? A: We found an active sinkhole at the end of Newbury Court where about 250 feet of pipe was destroyed. The sinkhole is 4 feet in diameter and about 7 feet deep. It is almost fully resolved. The City used an emergency contractor to replace the damaged pipe. It was identified two days ago and work started within one day of being found. Q: Could there be evacuations? A: Yes, it’s possible. We have evacuation plans in place with the Santa Rosa Police Department, but it wouldn’t be the entire Fountaingrove community at once. Q: How many homes would be evacuated if there was flooding? A: There are six different areas or zones we’ve identified. Varies from 78 residents to a couple hundred residents in each zone. Q: What are the eight sites? How far does the pipe destruction go? A: Each site is unique. It depends on the length of pipe that was made out of plastic. There could be a short section with minimal risk or a much longer reach of pipe with more risk. We are using closed-circuit television (CCTV) cameras to identify the scope of risk on each of the locations. Q: How were the sites identified? A: There’s a number of ways they have been identified. Initial evaluations looked at “outfall” locations and now CCTV inspections are occurring inside the pipes that are identifying and confirming the status. We have also been doing visual observations to identify sites with further investigation. Q: Is it the end point of the pipe where the fire melted the pipe, and then fire migrated all the way in? A: Yes, that is one scenario. It could have started at the end of the pipe, but also at the beginning of the pipe such as at a home site that was burning. We are looking at both public and private pipes. Q: Do any of these pipes go under roads or structures? Where do they run? A: We are still in the evaluation process to determine the impact. Most of the ones we’ve found at this point are the small sections that come in behind the public system – such as in your backyard where you have a drain all the way to where it connects to the public system at the roadway. There were some sites identified where pipes are crossing under access roads that belong to the city. Q: How large are the pipes? A: At this point we’ve identified as small as 15-18 inches in diameter, to as much as 36 inches in diameter. Q: Is there a damage estimate from the burned pipe? A: Not at this time. We are still in the evaluation phase. Q: Are all these 8 sites just in Fountaingrove? Are there other locations where this is happening? A: The reason why we’re seeing this HDPE (high density polyethylene) pipe primarily in Fountaingrove is because it wasn’t used until about 20 years ago and Fountaingrove is a newer development. The Coffey Park area is older, and also the risk if there was a pipe there is much less because it’s flat and the pipes are much shallower. In Fountaingrove there’s more risk if we have a collapse because the pipes are deeper and there’s more hillside exposure. Q: There was rain a couple of nights ago. Was there any impact from that? A: We didn’t see any significant issues, but it may have revealed the sink hole to help us understand the scope of this issue. Q: Are there workers out there right now? A: We have 10 strike teams with CCTV cameras that run into the entire length of the pipe assessing the suspect areas. We also have 6 teams of engineers and geologists that are assessing each confirmed site to determine the risks. Q: Can we see a map of the locations?